In the latest series of hikes this month, XRP observed a growth of 11% in just under 10 minutes. This comes after the coin doubled its value earlier this month, hiking from its yearly low of $0.25 to almost $0.80 before correcting to around the $0.50 mark. In its most recent hike, it broke one of the crucial levels that it has been struggling to break since the beginning of the month. This is the $0.57 mark, where the coin has bounced back multiple times. It was trading at around the same mark over the last week on 22nd September and dropped to $0.55 the very same day. It then saw a sharp drop to $0.44 on September 25th, only to see a sharp upwards movement to $0.54 the very same day. Proceeding this, it went up to the $0.56 mark, yet again bouncing off the resistance to fall. It bounced between the $0.56 and $0.50 limits for the rest of the week, finding stability at the $0.53 to $0.54. 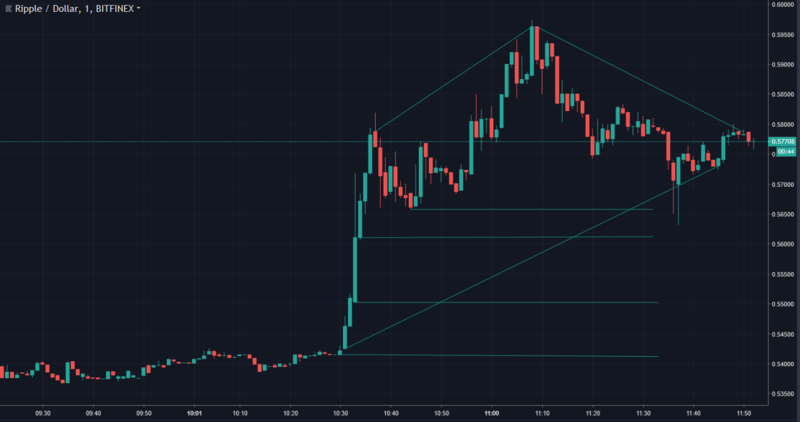 The technical charts find that XRP has major supports at $0.567, $0.561, $0.55 and $0.54. The trend lines at $0.596 – $0.576, are set to intersect with the uptrend from before the hike at $0.54 – $0.572. The crypto-space has been filled with bullish news for XRP lately, seeing as how xRapid was confirmed to be close to launch. Ripple is also adding more customers to their network of banks and financial institutions, thus allowing for XRP to be used for cross-border transactions through their product.